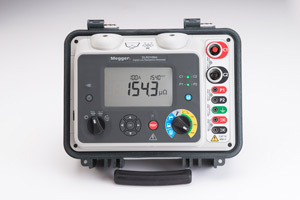 Norristown, Pa. February 2016 – Megger adds a new low resistance ohmmeter that features a Li-ion battery that supplies a constant 100 A current for up to 200 manual/auto tests in remote locations. The DLRO100 is the lightest 100 A battery-powered unit on the market. Designed to allow low resistance measurements to be taken across multiple applications in areas without access to power, this new DLRO has a CAT IV 600 VAC/500 VDC safety rating in accordance with IEC61010. The unit’s rugged design, intuitive interface and operational IP54 ingress protection against dust and water ensures reliability and ease of use in the harshest conditions. Ideal for use in applications that include switchgear, circuit breaker contact resistance, bus bar and cable joints, wire and cable resistance, lightning conductor bonding, welded joints as well as ground connections and joints, this new DLRO series is both portable and flexible. Offering a unique combination of features including DualGround testing, adjustable current ramping, high noise immunity and remote control, this DLRO series is offered in four models. All four feature CAT IV 600 VAC and can test currents from 10 A to 110 A. The mid-range model adds data storage and DualGround testing while the top range model adds the capability of asset tagging to enter unique asset IDs using the DLRO100 Asset Tag Windows application as well as Bluetooth download and USB remote operation. Each ohmmeter features three test modes – manual, auto mode and continuous mode. Manual allows users to initiate the test procedure once the probes are in contact with the object under test. Once the ‘test’ button is pressed the assessment begins. In auto mode the user selects the desired current and connects the test leads. Once leads are connected the test begins automatically. In continuous mode users connect the test leads and press the ‘test’ button to initiate the procedure. The unit will continue to test until the test button is pressed again or the procedure times out. Megger’s DLRO100 can measure resistance from 0.1 μΩ to 1.999 Ω, has a resolution of 0.1 μΩ and an operating temperature range of -20°C up to 50°C. Each unit features a replaceable Li-ion battery pack that can fully charge in 2.5 hours when fully discharged. 200 individual 100 A tests or up to two 10 minute continuous tests with a 100 A output can be performed on a fully charged battery.